The Catholic Church is one of the staunchest defenders of life in existence. Defending the sanctity of life is a core tenet of Church beliefs. So there was understandably a lot of outrage surrounding the Catholic Georgetown University’s decision to invite Cecile Richards, president and CEO of Planned Parenthood, the nation’s largest abortion provider, to speak. We respect our students’ right to express their personal views and are committed to sustaining a forum for the free exchange of ideas, even when those ideas may be difficult, controversial or objectionable to some. Georgetown University’s long-standing Speech and Expression policy governs the university’s response to controversial speech…. Ms. Richards is not being paid to speak. Student groups may invite any outside speakers and guests to campus. An appearance of any speaker or guest on campus is not an endorsement by the university…. Apparently, they’re not that committed to the sanctity and dignity of human life, if they’re willing to allow Richards to speak at their university. No, they’re not paying her. 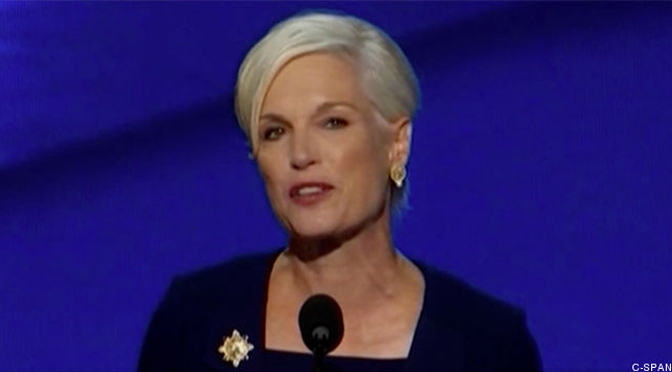 But by allowing her to speak, they are giving her — and by extension, Planned Parenthood — legitimacy. They’re saying that she is someone who is important and respected enough to be worthy of a lecture, whose ideas are valuable enough to be listened to. And that is deeply disturbing. The part that stands out? “Expression that is indecent or is grossly obscene or grossly offensive.” So we can only assume that Georgetown doesn’t find Richards and her life’s work of aborting as many babies as possible indecent, grossly obscene, or grossly offensive. This also goes, quite literally, against Catholic teachings. The United States Council of Catholic Bishops banned Catholic institutions — which includes Georgetown — from honoring people who defy Church teachings. They specifically included giving these people “platforms which would suggest support for their actions.” Ex corde Ecclesiae is an apostolic constitution issued by Pope John Paul II, and it specifically applies to Catholic colleges and universities. It states that Catholic teachings and discipline should influence all university activities. Clearly, Catholic teachings didn’t influence Georgetown’s decision to have Richards speak. There is no excuse for Georgetown to have Richards on campus in any way. And so now, they have a decision to make. What is more important to them? Upholding the teachings of the Catholic Church, or furthering their own anti-Catholic political beliefs? We should find out the answer to that question in just a few weeks.